A routine professional consultation held recently between Newberry archivists and their counterparts at UC Berkeley’s Bancroft Library ended with a surprising offer: a collection of images taken by amateur photographer Rudolph Michaelis during the early 1900s and held at Berkeley included an out-of-scope subset depicting Chicago and Midwest locations. Would the Newberry be interested in a transfer? The Michaelis Collection – comprising 167 glass plate negatives and 23 prints – was soon on its way to the Newberry, where it became part of our Midwest Manuscripts Collection, which gathers together manuscripts and archives relating to the history and culture of Chicago and the Midwest. Once staff viewed its crystal-clear landscapes, intimate portraits, and breathtaking shots of turn-of-the-century Chicago, the collection was also quickly slotted for digitization. The resulting digital images were soon uploaded to Internet Archive, where members of the public can now browse the contents of this sublime collection. The collection is a portal to a now-lost Chicago: a city of smokestacks, water towers, and rickety scaffolding, bursting at the seams with commercial energy and vertical expansion. Michaelis captures the Madison/State Street intersection – known in the first years of the 20th century as the “world’s busiest corner” – crowded with covered wagons and streetcars and teeming with workers employed by the district’s massive department stores. Business district, Madison and State Street, Chicago, between 1900 and 1905. Once known as “the world’s busiest corner,” this intersection housed the Mandel Bros. department store, which at the time employed 3,000 people. Other shots feature the ornate, rain-washed façade of the Inter-Ocean Building on West Monroe, tulip beds surrounding the Washington Park Conservatory, and the funeral procession of Sam Moy, known to Chicagoans at the time as the “King of Chinatown.” In some cases—like those of the Inter-Ocean Building and the Washington Park Conservatory—the buildings documented by Michaelis are quite literally lost: the Inter-Ocean Building became a theater specializing in sci-fi, horror, and, later, adult films, before being demolished in the 1970s, while the Conservatory was leveled in the 1930s. 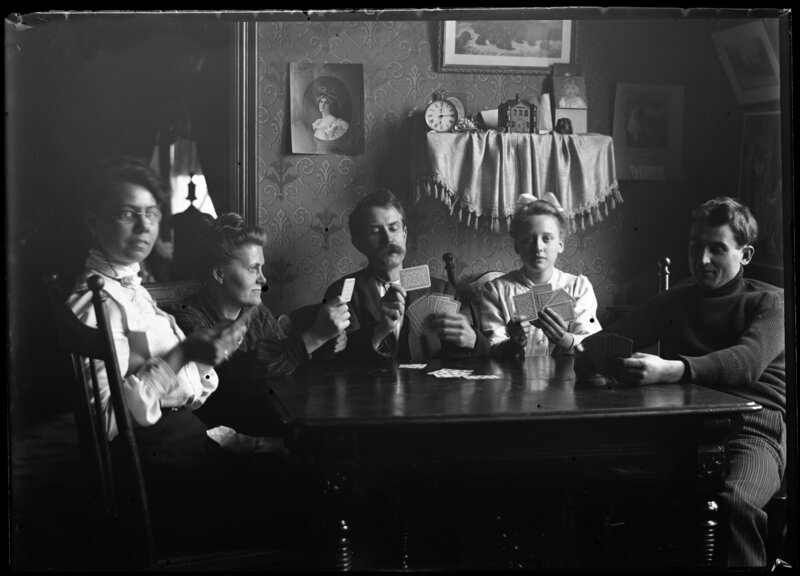 Just as striking are Michaelis’s depictions of domestic life, including a card game held between members of his family at a friend’s residence, and a set of negatives featuring a group of young children outside the Chicago Orphan Asylum. As if to leave no genre unexploited, Michaelis even produced a small set of nudes (not shown here). The Michaelis Collection also features a number of pastoral images of the Midwest outside Chicago – small towns, forest paths, country residences, and the obligatory cornfield. In addition to being viewable at Internet Archive, the negatives are accessible at Digital Newberry: Collections, a new site that provides integrated access to – and high-resolution downloads of – more than one million digitized images from the library’s collections. And for those inclined to make use of the Michaelis images, there’s even more good news: in accordance with its new open access rights and reproductions policy, the Newberry has made them freely available for any lawful purpose, commercial or non-commercial, without licensing or permission fees to the library. From their origin in early 20th-century Chicago, to a century-long sojourn on the West Coast, and now in the Newberry’s archives, the Michaelis negatives have completed an improbable journey. Celebrate the homecoming of this important new collection by exploring the Michaelis Collection today.